Suzuki has launched its latest lightweight and fuel-efficient outboard motor � the new four cylinder DF200A. 2,867cm3 "Big Block" displacement and a higher compression ratio for impressive acceleration and low-end torque. Importantly, the new DF200A weighs in at just 226kg, over 12% less than Suzuki's current V6 DF200 model. Just one look at the newly designed cowling of the DF200A indicates that this outboard is something special. However, the shape of the cowling represents more than just contemporary styling. Its design and the special baffling underneath work together to provide a semi-direct air intake system that provides cooler air directly to the engine's long track tuned intake manifold. The engine breathes even more efficiently thanks to Suzuki's proven Variable Valve Timing system and twin intake and exhaust valves for each cylinder. When it comes to speed and performance, boaters must balance power and weight. Until now, many boaters have had to deal with the weight of a V6 engine in order to achieve the level of performance they desired. Now, with the introduction of Suzuki's new DF200A, there's a real alternative to a V6. The addition of Knock and O2 sensors helps keep the engine running smoothly. The knock sensor ‘listens' to combustion, providing information to the ECM to precisely manage engine timing. The O2 sensor monitors engine operating conditions and provides input to the ECM to manage the fuel/air mixture for maximum efficiency and optimum performance. In addition, the DF200A features a water detection sensor to warn of moisture in the fuel system, a common concern given today's use of ethanol-blended fuel. With the introduction of its Lean Burn Control Technology, Suzuki's engineers have made fuel-efficient four stroke outboards even more economical. By taking full advantage of the computer control afforded by the 32-bit onboard ECM, and through the use of engine sensors monitoring everything from engine timing to ambient temperature, the system is able to provide the precise amount of fuel needed throughout the rpm range. 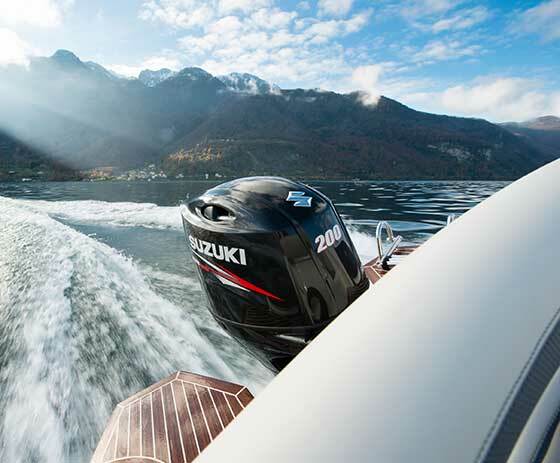 By utilising Lean Burn Control Technology, the inline-4 DF200A enjoys a significant improvement in fuel economy over Suzuki's V6 200 horsepower outboard. In fact, Suzuki Factory Testing indicates a 19% improvement at top cruising speeds. In addition to the DF200A, Suzuki is also introducing the DF200AP, which benefits from even more technology. The DF200AP will be the first 200 horsepower outboard on the market available with Keyless Ignition, Suzuki Precision Control drive-by-wire controls and Suzuki Selective Rotation. With Suzuki Selective Rotation, dealers and boat builders can set up engines in either standard or counter rotation, thanks to specially-designed gearing in the lower unit and the engine's electronic shift controls. When Suzuki first introduced its four stroke outboards over 15 years ago, it pioneered many technologies that are taken for granted today. For example, Suzuki was the first to feature fuel injection on its four strokes, the first to incorporate the offset drive shaft with the 2 stage gear reduction and a long track intake manifold, and when Suzuki introduced the world's first 200, 225, 250 and 300 horsepower four stroke outboards, it designed its engines consistent with the industry-standard mounting dimensions. In fact, every Suzuki outboard from the portable DF2.5 up to the flagship DF300AP fit on ABYC-standard 26-inch centres, which is a fact appreciated by any boater considering repowering with new outboards. As Suzuki has introduced its next-generation four stroke outboards, it has also introduced new technologies, such as Lean Burn Fuel Control, that deliver improved fuel economy, performance and reliability. With a surprisingly low weight, advanced technology like Lean Burn Control, Knock and O2 sensors, as well as performance-enhancing compression and intake specifications, boaters looking for a new 200 horsepower outboard need look no further than the DF200A and DF200AP. The advantages in terms of cost of operation (less weight, improved fuel economy, easier maintenance) and exceptional performance, make this engine a perfect match for all kinds of boats in the leisure and commercial sectors. Masahiro Yamamoto, General Manager for Suzuki Marine's European Liaison Office, said, "Once again our engineers have delivered a ground-breaking new outboard motor. I am privileged to have been able to test the new DF200A and am pleased to report that it delivers outstanding power and has a very satisfying engine note. I am confident that this new model will be hugely popular right across Europe and will cement Suzuki's reputation for producing outstanding large horsepower outboards." Available later this year, the new Suzuki DF200A is set to redefine lightweight outboard performance and fuel economy. The DF200AP will be available in early 2015.